HomeNew CarsNewsMaruti Ignis AMT – Features You Won’t Get And Why! By now, we’re sure you’re well aware of the unique features Maruti’s soon-to-be-launched mini-crossover offers. One of them, of course, is the automated manual transmission (AMT) option that is available with the petrol, and, for the first time in the segment, the diesel as well. Why isn’t the Ignis AT available in the top-end Alpha variant? The answer to that is two-fold. The first bit is more about marketing than anything else. Maruti does not want the Ignis' price to go beyond a certain bracket, which is why the AMT is limited to the mid-range Delta and Zeta variants. An AMT variant generally costs around Rs 50k more than an equivalent manual, so offering it on the top-end variant could make the upper limit of the Ignis’ price seem too expensive for some. Long story short, it’s to limit the price shock. The second reason is the Baleno. The Ignis is being placed below the Baleno on the price chain, so an Alpha AMT variant could put Ignis’ price dangerously close to its big brother’s, making the latter seem like less of an upgrade. Ok, but I’m interested in the Ignis AT. What am I missing out on? On the outside, the biggest miss are those unique LED projector headlights. You won’t get the LED daytime running lights either, nor do you get the Alpha grade’s puddle lamps. In the cabin, the AT won’t feature meter accent lights, nor will it get the Smartplay infotainment system that features Apple CarPlay, Android Auto and navigation. It does, however, get a music system with Bluetooth/AUX/USB/CD and the same 6-speaker sound system as the Alpha variant. Here, the Ignis automatic skips automatic climate control, a driver seat height-adjuster and a reversing camera. 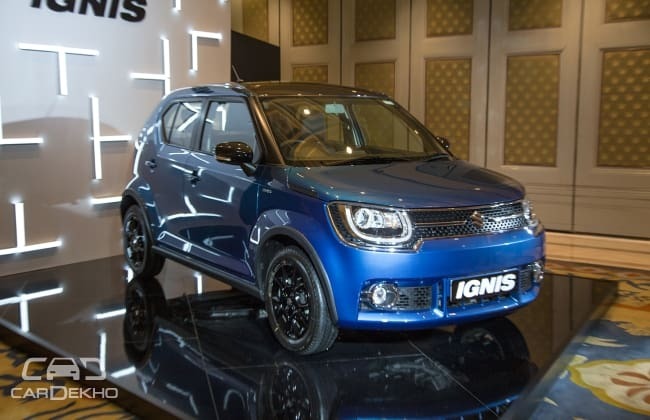 That said, even the Ignis AT has a good safety package as you get dual-airbags, ABS with EBD and ISOFIX child-seat mounts as standard, while the Zeta variant includes rear parking sensors and a rear defogger + wiper as well. Overall, the Ignis AT still gets well-equipped feature list, but unfortunately, getting it does mean skipping on some attractive kit, even if you’re willing to spend more for it.